Today’s post looks at medical training in the United Kingdom, a common interview question in both traditional and MMI medical school interviews. Medical School (4-6 years) Most UK medical courses last five years (four for accelerated graduate programmes and six if you undertake an intercalated degree). Courses may be traditional (preclinical lecture-based teaching then clinical years) or integrated (lectures and patient contact from day one). Foundation Years (2 years) Following graduation and gaining the title of ‘Dr’ graduates undertake the two-year foundation programme. This consists of six four-month placements covering medicine and surgical specialties and designed to give doctors a grounding for identifying and treating medical and surgical patients. Following the F1 year doctors become fully registered with the GMC. Core Training/Specialty Training (3-10 years) Eighteen months into Foundation training doctors can apply for core or specialty training. 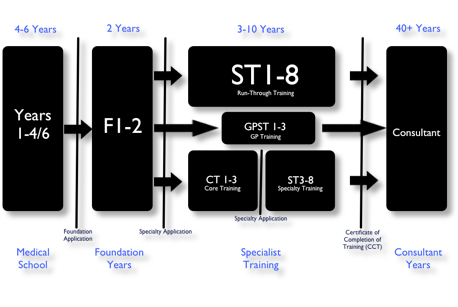 The selection process and training periods differ between specialties with GP training lasting three years and medical and surgical specialties requiring two years of core training followed by selection into higher specialist training at ST3 level. Some specialties such as radiology offer so-called run-through posts with no competition for posts at ST3 level effectively ‘running through’ from the end of F2 to consultant posts. Consultant Posts Following specialist training and completion of any exit examinations doctors receive their certificate for completion of training (CCT) and may apply for a consultant post in their chosen specialty. Most consultants are around thirty-two to thirty-five at the time of their appointment and may then undertake private practice. It is important to remember that medicine is constantly changing, in five years 50% of medical knowledge will have altered in some form, and this applies to training too. Interviews, length of training and roles of doctors are under constant scrutiny from both the department of health and the Royal Colleges (who are responsible for postgraduate training). One example is the three-year GP training programme which may be extended to five years in the near future. Be sure to check out the our Future Medics’ Essay Prize, Medical Xperience Course and Interview Question Bank.